Finally, February is here! The shortest month in days, but the longest in winter; February brings the harshest snowstorms and frigid temps leaving us with cabin fever. The most difficult part is coping with the freezing temps and keeping everyone entertained. Here are some ways you can rid yourself of the winter blues. “Exercise gives you endorphins. 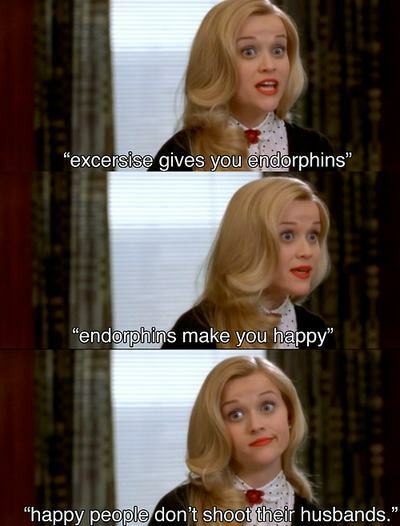 Endorphins make you happy.” (Elle Woods, Legally Blonde). One of my favorite movie quotes of all times rings true this time of the year. Yes, many people share the New Year’s Resolution of losing weight and going to the gym, but what you may not realize is that regular exercise DOES make you feel better! If you are not able to join a gym, consider taking a walk during your lunch hour, or if it’s too cold, take a lap around the building or go up and down flights of stairs. Any type of moving helps with the winter blues, so get out there and take a lap! We are all fans of the Marie Kondo show on Netflix here at Parish Giving. She is teaching us how to clean our closets, and clean up our lives. If it doesn’t bring us any joy, we are tossing it. Once your closet is cleaned out, you can dust and donate. This also applies to items around your house. If you have an old vase collecting dust, or some picture frames without pictures in them, why not put them in a box and donate them to your local Goodwill? Not only are you de-cluttering your life, but you are also helping out those who are not as fortunate. I know, I know… it’s difficult to find good, fresh produce during the middle of winter. Eating healthier will make you feel better. Aim to have either one fruit or one vegetable with each meal. Berries with your breakfast, salad for lunch, and steamed spinach for supper is just an easy way to squeeze in produce. Once spring and summer hit, you’ll be craving seasonal treats like peaches and tomatoes! Vitamin D is a necessity. It helps us feel good and feeling good means looking good. With the short winter hours, you may want to invest in a lightbox. You are then able to set the lightbox to act as a sunrise, so you feel as though the sun is rising as you are waking up (as in spring, summer, and fall…). If this is something that is not in your budget, then try to go outside for a couple of minutes each day. Breathe in the fresh air, and try to do it when the sun is out. Even short bursts of Vitamin D are better than no Vitamin D.
Yes, Parish Giving is able to help with your winter blues! If you are lucky enough to travel somewhere warm over President’s Day weekend, then remember to use our online giving services to remember your parish. Also, this is not just for when you are on vacation. In case your area is pummeled by snow this month, and your streets are too icy, you can give online and watch mass streaming online. Isn’t the internet a wonderful thing?! Just remember, spring is just a few short weeks away and so is Daylight Savings Time! We’ll be waking up with the sunshine soon enough! Keep warm and stay safe for the remainder of winter!